Best known as the actor, screenwriter, and director of America's The Office, B.J. Novak's debut collection of short fiction certainly delivers on humour. With stories broaching the Hare's rematch with the Tortoise, what would constitute Heaven for most people, and what really happened to Elvis, there are moments which are laugh out loud funny and utterly bizarre. A boy wins $100,000 in a pack of Frosties only to discover an unlikely family secret which will turn his life upside down. We meet the man who decided to invent the calendar, the first artificially intelligent being to fall in love, and a host of other interesting characters. 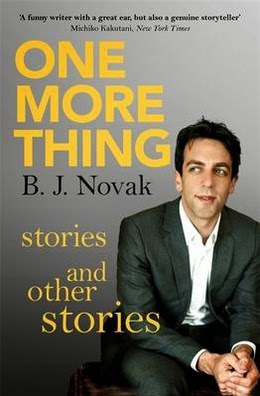 Between these longer stories Novak includes swift witty fictions which satirise modern society in hilarious ways. Novak's collection presents an incredibly diverse set of stories which keep the reader guessing from page to page. His prose is entertaining, sometimes dark, and often absurd. What the book lacks in cohesion, it makes up for in energy.